Jamun is indigenous to India. Its tree is tall and evergreen. Therefore It isgenerally grown as avenue tree or as wind break. Though the fruits are liked by all and sell at a high price, but it is still not grown as an orchard tree. 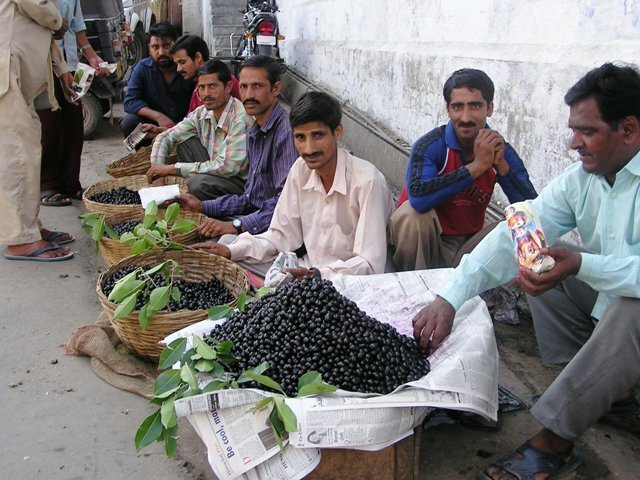 Jamun is found all over India. Since jamun is a hardy fruit, it can be grown under adverse soil and climate conditions. It thrives well under both tropical and subtropical climate. It requires dry weather at the time of flowering and fruit setting. Early rains are beneficial for better growth, development and ripening of fruit. Young plants are susceptible to frost. 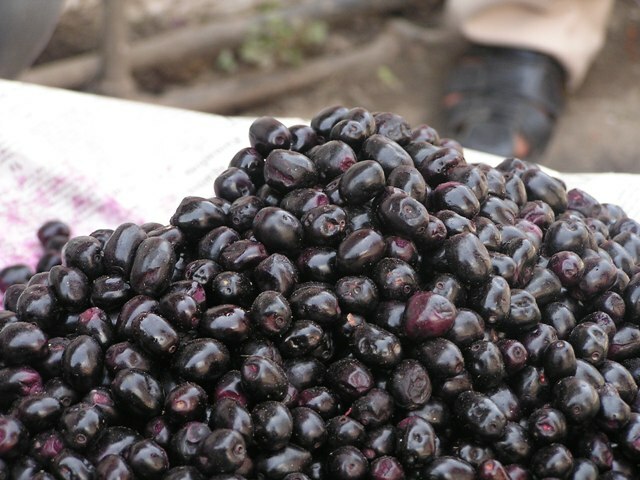 The jamun trees can be grown on a wide range of soils-calcareous, saline sodic soils and marshy areas. Deep loam and well-drained soils are, however, the most ideal. It does not like very heavy and light sandy soils. There is no improved variety for commercial cultivation. The most common type grown in north India is known as Raja jamun. This is a large-fruited type having oblong fruits of deep purple colour. A type having large- sized fruits is known as Paras in Gujarat. Another type found in Varanasi has no seed. A selection with desirable traits has been located by the agricultural university at Faizabad. It has been named by them as Narendra Jamun 6. Jamun is propagated both by seeds as well as vegetatively. Narendra Jamun 6 is usually multiplied by seeds. The seeds have no dormancy; hence fresh seeds can be sown (within 10-15 days) 4-5 cm deep at a distance of 25cm x15 cm. The seeds germinate in10-15 days after sowing. The seedlings become ready for transplanting in spring or next monsoon. Its seeds show polyembrony up to 30-40%. Therefore nucellar seedlings can be used to produce true –to-type plants. Seedling plants bear fruits of variable size and quality. Therefore, vegetative method is desirable for propagation of improved or selected types. Budding is most successful. It is done on one-year old rootstock having about 10 mm thickness. Patch and forkert methods of budding give more than 70% success if performed in March. In low rainfall area, July –August is ideal time for budding. Pits of 1m x 1m x 1m size are dug 10 m apart for seedling trees and 8m apart for budded plants. Pit digging should be completed before the onset of the monsoon or spring season. They should be filled with a mixture of topsoil and well- rotten farmyard manure or compost in 3:1 ratio. Monsoon season (July-September) is ideal time of planting. But it can also be planted with a good survival rate in spring (February-March) if irrigation facilities are available. About 100 -150 plants are required for planting a hectare land. Young plants need training for the development of framework, keep the main stem or trunk clean up to a height of 60-90 cm from the ground level by removing the basal branches and sprouts. Jamun plants do not require any pruning except removing diseased, dry and crisscross twigs. In pre bearing period, 20-25 kg well rotten farmyard manure or compost/plant/ year should be applied. For bearing trees, this dose should be increased up to 50- 60kg/plant/ year. The ideal time for applying organic manure is a month before flowering. Grown up trees should be applied 500 kg N, 600gand 300g K /plant /year. This should be spread near the canopy of the plant and mixed in soil by hoeing. Green manuring can be done during the rainy season. Intercropping karaunda or phalsa or seasonal vegetable crops in initial years between the rows or interspaces can be done. Sprouts arising from base of its plants should be removed timely and the plantation should be kept weed-free. Jamun is a cross- pollinated crop. Hence keeping of honey-bees near the plantation is beneficial for maximum fruit set and productivity. Irrigation should be given just after manuring. Young plants require 6-8 irrigations for better growth. In bearing trees, irrigation should be given from September to October for better fruit bud formation and May to June for better development of fruits. Normally 5-6 irrigations are required. Seedling trees start bearing at the age of 9-10 years, whereas budded ones take 5-6years. Flowering starts during March and continues up April in north Indian conditions. Fruits ripen during June- July or with the onset of rains. It takes about 3-5 months to ripen after full bloom. Fruits change their colour from green to deep red or bluish black. This is a non climacteric fruit hence it des not ripen after harvesting. Fully ripe fruits are harvested daily by hand picking or by shaking the branches and collecting the fruits on a polythene sheet. 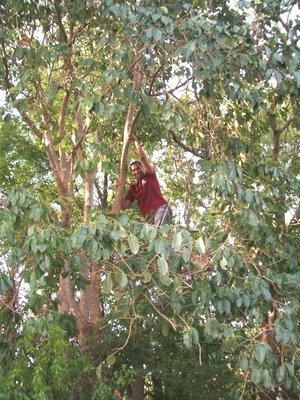 Jamun trees need a number of pickings, since all fruits do not ripen at a time. The average yield of fully grown budded and seedling trees is 50-70 kg and 80-100 kg /plant /year. Jamun fruits are highly perishable. They can be stored only up to 2 days at ambient temperature. Precooled fruits packed in perforated polythene bags can be stored for 3 weeks at 8-10 C and 85-95% humidity. There is no standard practice for grading of fruits. Blemished or bruised fruits must be sorted out before packing. Fruits are normally packed in bamboo baskets and transported to local markers. In the market, fruits are sold on green leaves or on pieces of newspaper. The fruits prepacked in leaf cup covered with perforated polythene bags have little or no damage, during handling. Handling of fruits during transit from market to home is also easier in this container. Jamun fruits can be processed into excellent quality fermented beverages such as vinegar and cider , and non-fermented ready-to-serve beverages and squashes. A good quality jelly can also be prepared from its fruits. The seeds can be processed into powder which is very useful to cure diabetes. These have a ready market. Heavy drop of flowers and fruits has been observed in jamun at various stages. About 50% flowers drop within the 3-4 weeks of flowering. It occurs at very young stage during 5-7 weeks of full bloom. The problem of flower and fruit drop can be minimized by spraying of GA3 (60ppm) twice, one at full bloom and other 15days after fruit set.